Karen Marie Garrett is a nimble fingered pianist that combines elements of new age and classical to formulate beautiful solo instrumentals. It’s About Love, her third studio release, is a 5 track recording that puts many things into focus. So what is Love? Simply put it is a timeless word that encapsulates many feelings and emotions. It can have several meanings dependent on who you are and what your own personal interpretation is. Ms. Garrett has a gift of interpreting that powerful word through her music. The five tracks that encompass this EP is a spiritual experience that many people will treasure. Her talent is apparent from the very beginning and it is consistent throughout this recording. While 5 tracks may not seem like much in this day and age of CDs coming out with 16-20 tracks it certainly makes a strong impression in the allotted time. For these ears that is the most important aspect of any listening experience. It is quality above quantity any day for my tastes and certainly I would not be the alone in that mindset. It may be difficult for some folks to fathom how one takes piano music and makes it all sound like love. If you let yourself absorb the sounds it feels as natural as any other normal daily activity. I am one that has an affinity to instrumental music so it is always a normal way of listening but even so if it was not, I believe I would be able to assimilate this music into love. 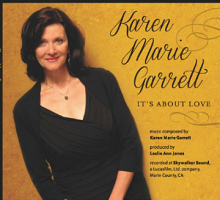 Karen Marie Garrett has created something beautiful and awe inspiring with It’s About Love and I would highly recommend you listen and let it work for you. This is no frills music that affords a listener both simplicity and elegance through sound. It will quickly relax you and make you feel renewed once you have opened the doorway to your heart.